Sammath sidestep the distracting glamours that have come to represent black metal in popular consciousness, instead staring down the listener with an unremittingly caustic visage and daring him to turn face. The process that started on Dodengang is now complete as Sammath cast aside almost all pretensions to overt melodic grandeur and the eclectic nature of their earlier work, dousing themselves in a furnace of rapid, militaristic percussion and short, angular riffing. Drawing from the same spring of inspiration as a Profanatica or Demoncy, Godless Arrogance is utterly single-minded in intent and execution, and tangibly oppressive in atmosphere. 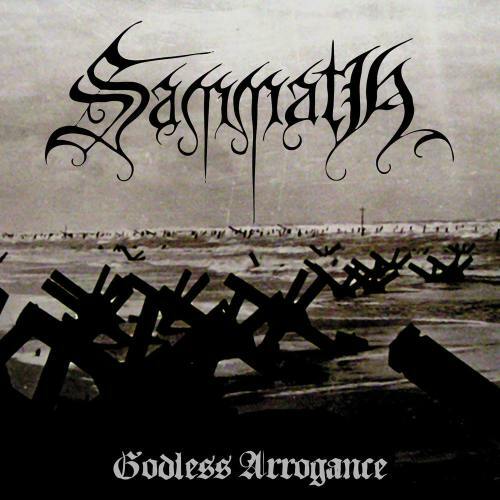 Sammath, however, eschew the primitive aspects of those two bands, channeling their anger through a technical approach more reminiscent of Morbid Angel and Angelcorpse. Through it all, a guitar tone soaked in industrial-strength gain acts as constant companion across the sulphur-strewn lands of the band’s visions. The effect isn’t coincidental; Godless Arrogance is an explicitly irredentist reclaiming of black metal from the clutches of petal metal and religion (of the upside down kind), a call to arms orchestrated by a veteran band, and one borne out of an intense disgust with the status quo. Sammath are not inclined to spoon feed their audience. Godless Arrogance isn’t entirely bereft of melody; elegant, heroic phrases lie buried under a wall of sound not unlike what Immortal essayed on Pure Holocaust, but the band’s unflinchingly confrontational pose challenges the listener to work at uncovering these wonders. These passages are brief and intermittent, however, and often drowned in a vortex of activity created by a sharp, switchback style of riffing. Drums are hit with some power, an aspect not to be disregarded and one that lends this album a large quotient of its thickness of sound. Vocals, keeping concert with other components, are hateful rasps. Hate, in fact, is the binding essence of Godless Arrogance. There are well developed songs but there are others that lurch and explode in shrapnel for no reason other than all-consuming hate. A marker in the sand, Godless Arrogance is the embodiment of black metal, if not always in sound then certainly in spirit, and the very album that the genre needed in 2014. This entry was posted in Uncategorized and tagged Black Metal, Dodengang, germany, Godless Arrogance, Netherlands, Sammath, Triumph IN Hatred. Bookmark the permalink.